It's December and we're well into the 2004 holiday season. 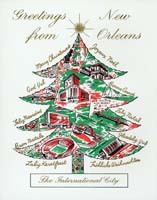 For this month's Gallery we are featuring "Official" City of New Orleans holiday cards from the last fifty years. 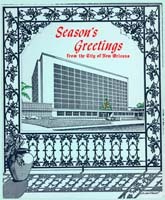 We're not sure just when the Mayor and City Council began sending out such cards, but the earliest one in our collection appears to the ca. 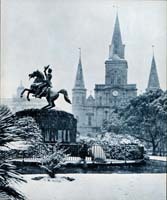 1954 version displayed here. Most of the cards in this Gallery fall into the "Official" category, that is, cards carrying the names of the Mayor and the members of the Council. 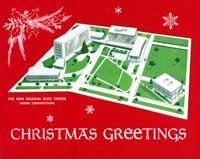 Several, though, are more properly described as personal holiday greetins, possibly cards that accompanied gifts from Mr. and Mrs. Mayor. However you describe them, these greeting cards are our way of saying HAPPY HOLIDAYS! Click on the images below to see a larger version and accompanying text. And click HERE to visit previous Images of the Month.